The electric scooter race in India is getting hotter and more competitive. After Hero Electric, Yo Bikes and many other small brands its now BSA (yes the cylce manufacturer) which has forayed into the burgeoning electric scooter market. Under a new name, BSA Motors the company has launched a series of light electric scooters: Smile, Diva, Street Rider, Roamer and Roamer+. The names are as basic as the bikes themselves and will cater to the need of short distance commuting for the budget conscious and the environmentally oriented. The eScooters are being manufactured at BSA Motors new plant in Ambattur which can churn out 150 eScooters a day with expandable capacity of 300 units per day. 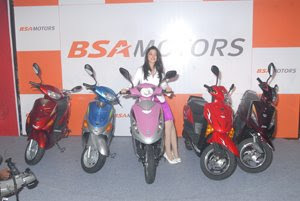 The first batch of BSA eScooters will be handed out to customers in Chennai on 10th November 2008. Smile - The most competitively priced bare bones e-Scooter in the country for the age group of 13 to 18 years; 250 W, top speed - 25kmph. No license and registration required. Diva - eScooter designed for girls in the age group of 16 to 20 years; 250 W, top speed - 25kmph. No license and registration required. Street Rider - Sporty model for young buyers; 250 W, top speed - 25kmph. No license and registration required. Roamer - For adults; 500 W, top speed - 40kmph. Roamer+ - For riding with pillion; 800W, top speed - 45kmph.